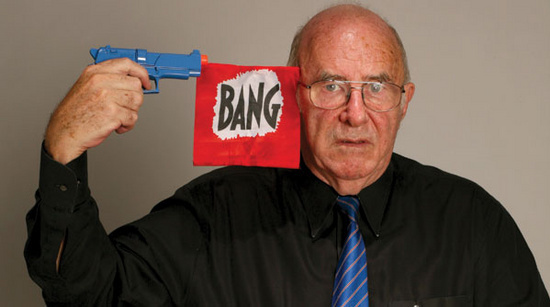 I’d forgotten all about Clive James. Not completely, you understand, or even intentionally, but when you’ve not seen on heard of a person for a while, you tend to forget about them. A bit like Jimmy Carr and the tax man. And like Mr Carr I realise I have made a terrible mistake. There was a time when you couldn’t turn on the TV in the UK without watching this bald, fat Australian wander around some far-flung corner of the globe, or lolling behind his desk while he introduced his next guest on his chat show. Like most talented performers, TV companies have a tendency to over-expose them, to milk their cash cow til it collapses in exhaustion and apathy. I feel Clive suffered a similar fate. The public like a talent, but can whiff from 300 yards the smell of a tired idea and over-used performer. So it’s sad to hear that he has announced that he’s losing his fight against leukaemia, with which he was diagnosed two-and-a-half years ago. That would explain his absence from our screen, after having dominated it for so long. Take Michael MacIntyre plus Noel Edmonds. Add some talent and you’ll realise how often our Clive seemed to be on the box. But I liked him, as did millions of others, even if the easy-tv option of fronting shows about the world’s worst adverts was clearly below this man’s level. But it was his writing which I remember made me laugh out loud, and I’m annoyed that I had forgotten this fact. I read James’s autobiographies and travel writings before I’d discovered Bill Bryson. His tales from his childhood in Australia are arse-splittingly funny, every bit as good as Bryson’s accounts of life in mid-west America, and I can pay him no greater compliment then that. When I read this stuff, I realised that I’d made so many wrong life-choices along the way, and if I could turn back the clock, I’d pick up a pen and start writing, and stop farting around with photographs. Luckily, our friends at Wikipedia (that’s not the lot holed up in the Ecuadorean Embassy) have collated some of Clive’s funnier quotes, some of which I list below. Re-reading these, I know now my next move. Cease wading though Antony Beevor‘s magnificent and enormous Second World War, and re-buy Unreliable Memoirs (from where all the following quotes are gleaned). I’ve read enough books about the War, I haven’t laughed enough. Yet. Riding the crest, I diversified, exploiting a highly marketable capacity to fart at will… By mastering this skill I set myself on a par with those court jesters of old who could wow the monarch and all his retinue with a simultaneous leap, whistle and fart. Unable to extend my neo-Homeric story-telling activities from the playground to the classroom, I could nevertheless continue to hog the limelight by interpolating a gaseous running commentary while the teacher addressed himself to the blackboard. The whole secret of raising a fart in class is to make it sound as if it is punctuating, or commenting upon, what the teacher is saying. Timing, not ripeness, is all. ‘And since x tends to y as c tends to d,’ Fred expounded, ‘then the differential of the increment of x squared must be… must be… come on, come on! What must it flaming be?’ Here was the chance to to give my version of what it must be. I armed one, opened the bomb bay, and let it go. Unfortunately, the results far exceeded the discreet limits I had intended. It sounded like a moose coughing. As I begin this last paragraph, outside my window a misty afternoon drizzle gently but inexorably soaks the City of London. Down there in the street I can see umbrellas commiserating with each other. In Sydney Harbour, twelve thousand miles away and ten hours from now, the yachts will be racing on the crushed diamond water under a sky the texture of powdered sapphires. It would be churlish not to concede that the same abundance of natural blessings which gave us the energy to leave has every right to call us back. All in, the whippy’s taken. Pulsing like a beacon through the days and nights, the birthplace of the fortunate sends out its invisible waves of recollection. It always has and it always will, until even the last of us come home. This entry was posted in Misc and tagged Antony Beevor, Clive James, Jimmy Carr, London, Noel Edmonds, Shane Gould, Unreliable Memoirs by The Ed. Bookmark the permalink. Is it your demeanour or just my perception…? Keep up the good works,though ‘upbeat’ would be nice as well…?! 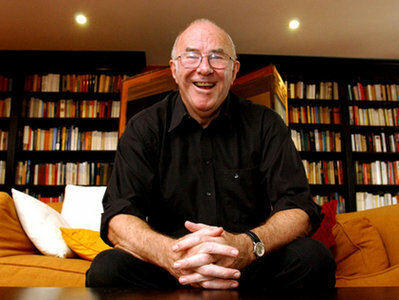 I’ve always fancied Clive James. His voice just does it for me. Maybe I had better tell him before its too late. Maybe he’ll read this. Will be listening to R4, 8pm, Saturday. Thanks for the tip-off.